IMPORTANT NOTE:If your package is broken or leakage without pump or if any defective item or any dissatisfied problems please kindly write to us first for solution before leave a negative comment.We will send replacement and solve for you immediately. Balloons are tons of fun at a party on their own, but when they're twisted, bent and folded into unique shapes, they become extra special! Whether you're a seasoned pro or just beginning to learn how to make balloon animals and art, you need to have the right supplies at the ready to bring your creations to life. TECH-P 260Q Deluxe Magic Vapor Balloons are made specifically for balloon art. Uninflated, the 260Q deluxe balloons are ultra compact sheaths that measure just 29 to 30 centimeters, making them very easy to keep stored in a bag or your pocket. When inflated, the latex balloons are approximately 2 centimeters wide by 120 to 130 centimeters in length, giving you the perfect material for shaping and twisting. We make our latex balloons extra tough to resist breakage. For pros, this means being able to twist and shape creations at a faster pace than ever before, and beginners won't have to worry about constant popping while they practice their technique. TECH-P 260Q Deluxe Magic Vapor Balloons are incredibly easy to fill because we include a dual action pump with every order. The pump At 11 inches by 2 inches in size, our good quality pump is easy to carry along with the balloons to any party or event. When you purchase TECH-P 260Q Deluxe Magic Vapor Balloons, you'll get a total of 200 of our top quality twisty balloons in a mix of eight colors. Also included are a total of 192 self-adhesive eye stickers for putting a special finishing touch on your balloon animals. 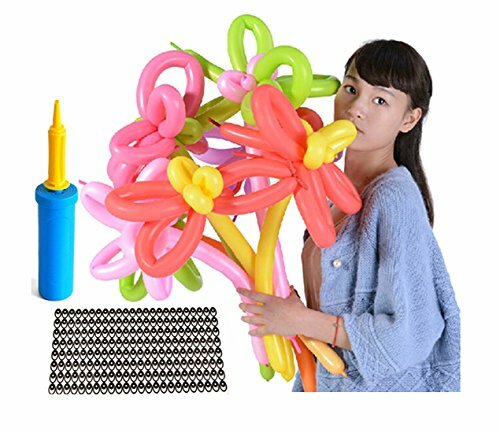 Bring fun to any party or hone your skills with the best latex balloons for making balloon animals on Amazon. Order the TECH-P 260Q Deluxe Magic Vapor Balloons today! LET YOUR IMAGINATION RUN WILD These twisty balloons are tough enough to resist breakage and allow for easy shaping; Pump and 192 animal eye stickers included to complete your creations. A TRUE CROWD PLEASER Get 200 party & holiday balloons for a great low price, so you'll have plenty of supplies for making balloon animals & other creations for everyone. INFLATE FAST PUMP-Good Quality Dual action pump lets you fill up these magic vapor balloons very fast! If you have any questions about this product by TECH-P, contact us by completing and submitting the form below. If you are looking for a specif part number, please include it with your message.